As a loyal fan of the Kinesis Freestyle keyboard for the past year, I was excited to hear about the second generation model coming out in 2012. Such is the popularity of the new Freestyle that I had to stand in line for a review sample. That sample finally arrived last week. Having used it for a few days, I can say that there’s nothing really revolutionary here. However, most of the changes Kinesis made were, in my opinion, worthwhile. The Freestyle2 brings a thinner profile and a few tweaks to the layout. The new Freestyle2, shown on the bottom with the black edge, is about 1/4″ thinner overall than the original. In case you haven’t noticed, the trend with keyboards runs toward thinner profiles. Thin keyboards undeniably look fantastic (see: Apple), but there’s an ergonomic benefit here too: The thinner your keyboard, the easier it is to get your hands properly above it, which can help your wrists stay in a more neutral position. Is a quarter inch less total thickness going to make a life-changing difference? Probably not, but the desk-hugging design of the Freestyle is just one more thing to like about it – and yes, it does look pretty good as well. Included media control keys are volume up, down, and mute. Though it’s truly nice to have volume controls on the keyboard now, not everything is rosy in this department. One thing Kinesis didn’t change is the way the Fn key operates – like a toggle switch, not a momentary button. 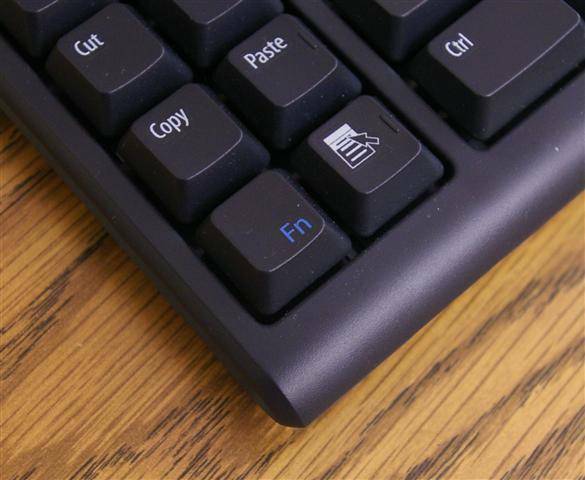 In case you’re not familiar with it, the Fn key is the shifter that enables alternate functions on the rest of the keyboard. 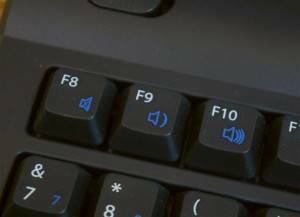 Among these alternate functions are the volume keys, which, without Fn engaged, are simply F8-F10. Fn also activates the built-in numeric keypad, so it’s not the sort of thing you want to leave on at all times. And therein lies the rub. On an ordinary keyboard, the media buttons are single-purpose and work with one finger. On the Freestyle2, you need not only two fingers, but both hands; the Fn key is located too far from the media keys to hit the combination with just one. Worse, the Fn button is “sticky.” Remember the toggle switch vs. momentary button comparison? Once you hit Fn, it stays engaged until you hit it again. That makes three – count ’em, three – keystrokes to mute the audio every time the phone rings, and three more to un-mute it after I hang up on the telemarketer. On the new Freestyle, Fn has switched placed with right-click. To prevent annoying fits of gibberish like the one above, Kinesis moved the Fn key to the corner, swapping it with the relatively harmless right-click. Now, it’s much more difficult to accidentally hit the grammatical self-destruct with your little finger while typing. This one was made to order for me. The old useless Search button has been removed from the left-hand special key area, replaced with a much more helpful Undo button. This will save me a lot of reaching for Ctrl-Z while designing with my right hand – a big little upgrade indeed. Hey, come back here with my Insert key! 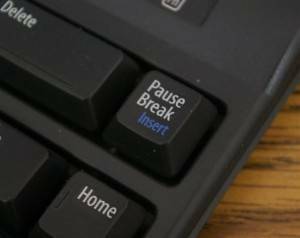 If anyone reading this regularly makes use of the Pause Break button on your keyboard – or even has a clear idea of what it’s for – please leave a comment to enlighten me. I can’t recall ever having used the Pause Break key in my life, but I do use the Insert key a lot. 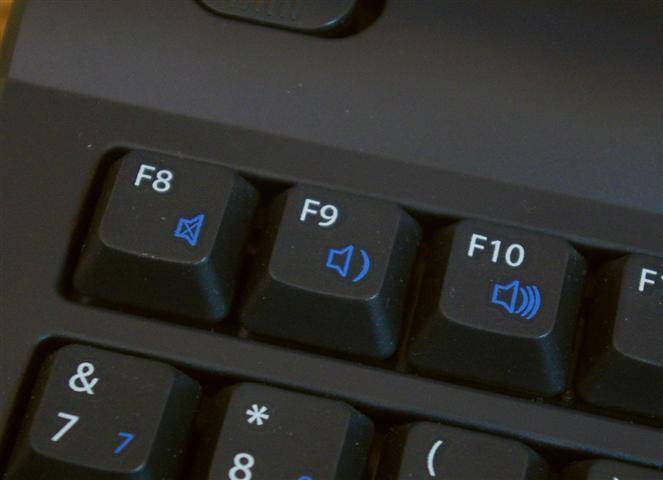 The Pause Break key, with Insert demoted to a Fn alternate. The Freestyle has always had these two functions on the same key, but until now Insert was the senior partner and Pause Break the junior, working only with Fn engaged. To my chagrin, Kinesis decided that this relationship should be reversed with the Freestyle2. Now I have to hit Fn every time I want to use Insert – and as we saw above, that’s hardly trivial given the way Fn works on the Freestyle. Most keyboards, including the original Freestyle, have little plastic ridges to help touch typists find the home keys without looking down. 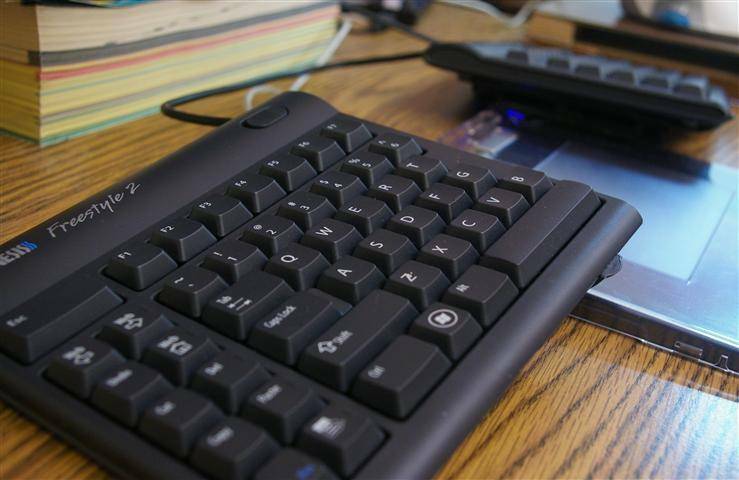 The Freestyle2 adds new bumps to feel-mark other parts of the keyboard, such as the edges of the Home and End keys. I especially appreciate the one on the right-hand Delete button. This extra Delete is handy for me, but on the old model it was easily confused with the adjacent Backspace. Hitting one for the other is never good, so it’s nice to have a touch identifier to help tell them apart. While I mostly like the Freestyle2 changes, there are a few other things I would have loved to see in the new model. I’ll list my ideas here in the hope that Kinesis will consider them for future upgrades. Why not change the Web key to something more useful? Kinesis Corporation, no doubt, has a great market research department. I am sure these decisions are only made after much consideration by people with more degrees than I’ve got fingers. Nonetheless, I find it hard to believe that anyone in 2012 still wants a special keyboard key to open their homepage. These days, who closes their browser frequently enough to need a shortcut key for re-opening it? This isn’t 1999; the Internet is the center of everything now. But the Freestyle’s Browser Home key lives on, sporting only a new name – “Web” instead of “Home.” In my original Freestyle review, I ranted about how the Web key is worse than useless. I did follow up on that by remapping the key, with great difficulty, to a kinda-sorta-working Alt key. At least it doesn’t destroy my work when touched by mistake. To me, the Back and Forward keys are only slightly more useful, and should also be considered for new roles in the future. 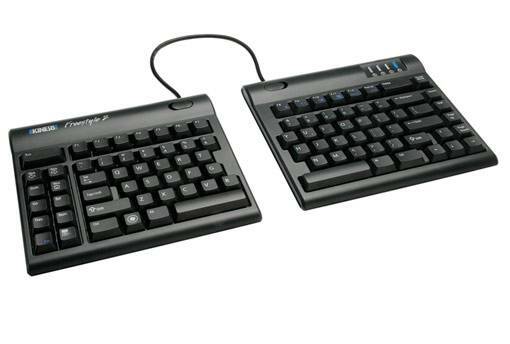 One of the best features of the Kinesis Advantage keyboard is its on-board programming ability. For instance, I might set Ctrl-4 to type my name and a greeting, and the keyboard would remember this shortcut even when plugged into a different computer. This feature is also great for remapping keys you want to move or reassign, such as the Browser Home key discussed above. Kinesis: I would pay extra for this feature. Why not offer it as an upgrade to the Freestyle? Programmers around the world will thank you. Will my old accessories work? Some original Freestyle accessories will still work with the thinner Freestyle2, and some won’t. 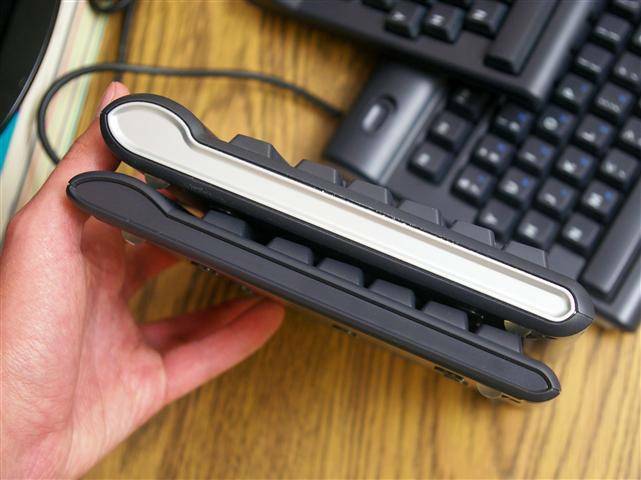 My V3 center lifters snap onto the keyboard and work without a fumble. Owners of the palm-rested VIP kit, however, will need to purchase an upgraded version for compatibility with the new Freestyle. As an owner of the old Freestyle, I personally would not pay retail to upgrade. The thinner profile and key changes are nice, but not in themselves worth it for my purposes. If, however, you’re still considering the purchase of your first ergonomic keyboard, the Freestyle2 enhancements are another great reason to choose Kinesis. Disclosure: This review was made with a complimentary sample from Kinesis.